There are plenty of examples of the federal government trying to get into the retirement planning business. Let’s examine a few of those efforts. Automatic IRA Act of 2010 – Amends the Internal Revenue Code to: (1) require certain employers who do not maintain qualified retirement plans or arrangements to make available to their eligible employees a payroll deposit individual retirement account (IRA) arrangement (automatic IRA arrangement) which grants such employees the right to opt-out of participation; (2) require the Secretary of the Treasury to provide employers with a model notice for notifying employees of automatic IRS arrangements and to establish a program to assist employers in the implementation of such arrangements; (3) allow employers who do not have more than 100 employees a tax credit for costs associated with establishing an automatic IRA arrangement; (4) impose a penalty on employers who fail to provide eligible employees access to automatic IRA arrangements; and (5) increase the tax credit for small employer pension plan start-up costs. Requires the Secretary and the Secretary of Labor to jointly conduct feasibility studies on extending spousal consent requirements to automatic IRAs, promoting the use of low-cost lifetime income arrangements, and using investment data to notify individuals with multiple small balance retirement accounts of consolidation options. The bill was referred to committee, but died in committee. Senator Bingaman reintroduced the bill under S.1557 in the 112th Congress under the Automatic IRA Act of 2011. This bill also died in committee. Democrat Representative Richard Neal reintroduced the bill under HR4049 and called it the Automatic IRA Act of 2012. Being persistent, Neal repeated the procedure in 2013 and 2015. Each time, the Automatic IRA Act died in committee, but it is quite apparent that the federal government is very interested in the retirement industry. In 2012, Forbes ran an article titled, “Watch Out: Your 401(k) Is Being Targeted“. This piece discusses in great length the possibility of stripping the tax incentives from 401(k) plans as a means to reduce the deficit. The myRA program was announced by President Barak Obama on January 28th of 2014 during the State of the Union Address – myRA is short for “my retirement account”. The myRA program is sponsored by the Treasury Department and administered by Comerica. The myRA program is designed to “help” Americans save money for retirement by allowing them to deduct a portion of their paycheck to be invested in Treasury securities. As of August 1, 2016, the daily Treasury yield curve rates were 0.20% for 1-month securities, 0.40% for 6-month, and 0.50% for 1-year. The federal government is touting the myRA program as a success, but strangely won’t say how many people have actually signed up for the program. Could this be just another step in the direction of a government takeover of 401(k)s and IRAs? First add onerous rules and regulations on brokers and then declare yourself (the federal government) as the best one to do the job. Oh, and in the best interest of the U.S. citizens, of course. 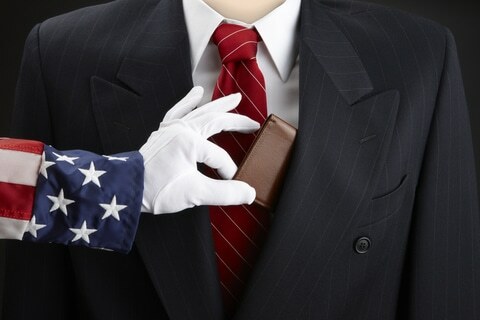 The bottom line is, the U.S. government is broke and deeply in debt. So, with $24.1 trillion in retirement assets just sitting there, how long before the Feds can no longer resist the temptation and go for an all-out takeover of the retirement industry? RELATED >> Is the federal government eyeing your 401(k)?